Sign Up for Our Newsletter! 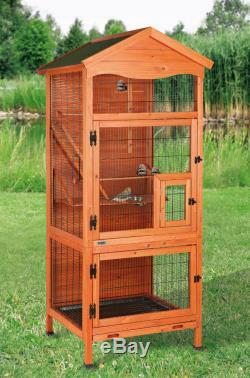 Trixie Pet - Aviary Bird House (55951). TRIXIE's Aviary Bird House is ideal for parakeets, finches and other small birds. The solid pine construction and use of the finest materials means this shelter will endure years of use with very little maintenance. 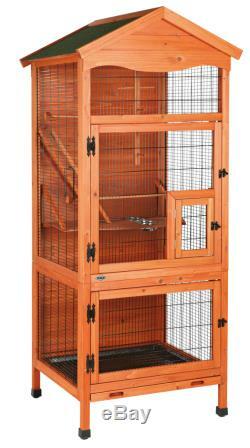 Ideal for multiple small birds such as parakeets and finches. Includes: 2 perches, 1 climbing frame, 1 ladder, 1 feeding tray and 2 stainless steel bowls. Horizontal bars for climbing and attaching toys plus side flap for attaching birdbath. 3 different sized doors at the front with wood paneling at the back. Pull out plastic tray and extra floor grid for easy maintenance. Dimensions: 30.5" W x 30.5" D x 70.75 H. Materials: pine, powder-coated metal lattice, composite asphalt shingles, metal hardware, hard-plastic. How to Return an item. You will be provided a Return Authorization Number. This Return Authorization Number will need to be attached to the package that is sent back to us. Non-Defective Items (Changed mind, misordered). Non-Defective Large Items (Changed mind, misordered). In situations where a damaged product can be repaired by either a factory-technician or end-user, Rural King may opt to provide replacement parts and/or a service technician instead of returning the whole item. You refuse or return a non-damaged, non-defective item. All generator sales are final. Merchandise that has been visibly used or worn. Rural King has over 100 stores in a 12 state area (Illinois, Indiana, Kentucky, Tennessee, Ohio, Michigan, Missouri, Pennsylvania, Florida, North Carolina, West Virginia, and Virginia) and is continually growing! Rural King boasts the best customer service and prices. The item "Trixie Pet Aviary Bird House (55951)" is in sale since Wednesday, August 17, 2016. This item is in the category "Pet Supplies\Bird Supplies\Cages". The seller is "ruralkingsales" and is located in Fort Worth, Texas. This item can be shipped to United States.